Mexican Polypody FernEvergreen fern. Thick leathery dark green fronds. Moist soil required. Botanic..
Leather Leaf PolypodyEvergreen fern. California native. Creeping habit. Leathery dark green fronds. ..
Common Polypody FernEvergreen fern. Narrow, divided, leathery, medium to dark green fronds are deepl..
Braun's Holly Fern/Sword FernEvergreen fern in mild climates. Dense, upright habit. Thick fronds are..
Western Sword FernEvergreen fern. 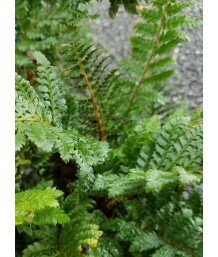 Robust and reliable fern offers superb texture with glossy, leathe..
Japanese Lace/Tassel FernEvergreen fern. Lustrous shiny leaf fern adds elegance to any garden. Lacy..
Sift Shield FernEvergreen fern. Outstanding for shade, with feathery, dark green fronds that look tr..
Korean Rock FernHerbaceous fern. Excellent small scale fern for the south. Lush dark green foliage i.. Felt FernEvergreen fern. Elongated, slightly furry gray leaves. Slender, dark colored stalks. Modera..
Japanese Felt FernEvergreen fern. Thick, dark-green blades are held upon slender creeping rhizomes. ..
Japanese Felt FernEvergreen fern. A special, variegated form of tongue fern to any woodland garden, ..